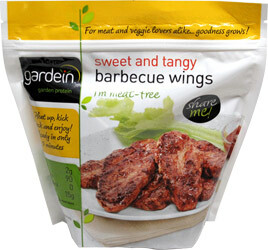 If you like your vegan wings with flavor but prefer that they’re not fiery hot, Gardein has a new treat just for you! These tasty meat-free wings come with a generous serving of sweet and tangy BBQ sauce that makes the perfect complement to Gardein’s famous vegan protein. 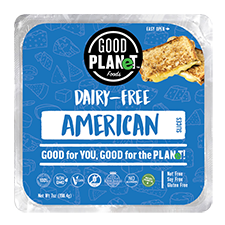 Excellent as an appetizer but even better as a main course, you can also cut them up for making wraps, or, top off your favorite vegan pizza for a true barbecue delight. Each 9 oz. (255g) package contains around 10 wings. $5.99 per pack. 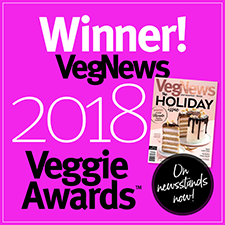 Ingredients: Gardein Vegan Chicken (water, non-GMO soy protein isolate, non-GMO vital wheat gluten, organic ancient grain flour [KAMUT khorasan wheat, amaranth, millet, quinoa], natural vegan flavors [from plant sources], modified vegetable gum, yeast extract, sea salt, organic cane sugar, potato starch, onion powder, garlic powder, pea protein, vinegar, carrot fiber, beetroot fiber, extractives of paprika and turmeric), Sauce (crushed tomatoes [tomatoes, salt, citric acid], organic cane sugar, water, molasses, malted barley extract, vinegar, sea salt, spices, corn starch, xanthan gum, onion powder, turmeric, hickory smoke flavor, paprika, garlic powder. From Oscar of West Bend, Wisconsin on 3/17/2015 . Very tender, but it has a bland flavor even though the sauce is flavorful. I wouldn't buy again. From Anonymous of Danbury , Connecticut on 3/9/2015 . Another great product from Gardein!!!! I loved these a lot. I don't think they have a meaty texture but still good. From Trae Bee of Milwaukee, Wisconsin on 1/9/2015 . From Anonymous of Inkster, Michigan on 10/17/2014 . From Anonymous of Columbus , Ohio on 2/3/2014 . Just tried these. Love spicy. These are a bit spicer than z I like but would get these again.